I’ve been drafting patterns using a copy of Louis Devere’s The Handbook of Practical Cutting on the Centre Point System (1866) for almost two years now. Of the available drafting manuals from the Civil War period, this seems to be the most complete and easiest to learn. One of the more difficult concepts to understand is how Devere varies the size of a pattern. He uses a size 18 3/4 breast as the basis for all of his patterns, which is equivalent to a 37 1/2 chest. This is called the proportionate model. If you are lucky enough to have a 37 1/2 chest (and the other corresponding measurements are the same), you can draft the patterns as they are straight from the book, with a normal ruler . Unfortunately, very few people fit these measurements, so adjustments have to be made. Then, it’s a matter of converting that 2.8 decimal into inches. This comes out to somewhere between 2 3/4 and 2 7/8. 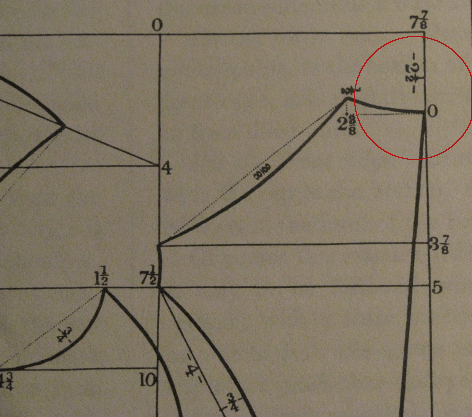 As you can see, this method is not very accurate, and prone to mathematical errors. And it takes a long time when you have to do 20 or 30 measurments this way. Luckily, Devere was a fairly smart guy. He devised a set of rulers, called Graduated Rulers. 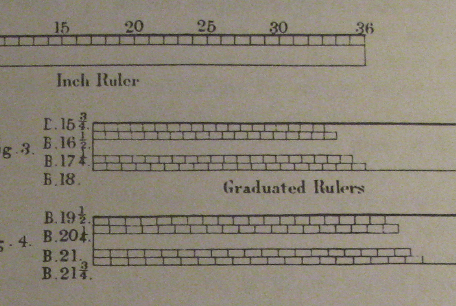 The graduated rulers are, “a series of measures, which are successively graduated larger and smaller than the common inch measure, and are used to draft patterns for larger or smaller sizes than the 18 3/4 breast.” What does this mean? Instead of doing those calculations above, you simply choose a correct sized ruler and then draft the pattern as it is in the book. For example, you are measuring someone and they have a 48 inch chest. You would then go to your set of rulers and choose the one marked size 48 (or 24 inch breast). If you compared this to a normal inch ruler, you would see that it is a lot larger, yet it still has 12 inches to it. Where can you get these rulers? In Devere’s time, these rulers could be obtained from Devere’s company, and came on paper, tapes, or on wooden rulers. Devere has long gone out of business, but luckily, the rulers are not too difficult to make yourself. I’ll save you that trouble though. I have created a set of graduated rulers, sized 34 through 50, for your convenience. They are on 11 x 17 inch paper, so you’ll need to find a print shop to print these. I was able to get mine printed for $3, on a nice heavy weight card stock, so it’s not going to hurt your wallet. They are in Adobe pdf format. When printing from Adobe Acrobat, be absolutely sure to set Page Scaling to None. If this is not done, your whole set of rulers will be off. After they are printed, I would take a normal inch ruler and compare it to the size 37 1/2 graduated ruler. They should be exactly the same. If they are off, it was printed wrong, and you need to check your settings and try again. Without further ado, here are the rulers for you to download. I hope they will be of assistance to you. Thank god my copy of the book did not have these and my dad said we could do the math 🙁 Now I do not have to. Here in the UK, I found an original wooden Dever ruler, in poor condition.